Do you look after anybody or do things for other people, whether family member, relative, neighbour or friend (whether you work or not)? Are you a young person (under 18) looking after or regularly helping someone else (family member or other person)? The Surgery likes to register all our Carers so we are aware of your demanding role and are able to support you. We also hold a Caring Café where there is information available and people to talk to over a cup of tea and a slice of cake. 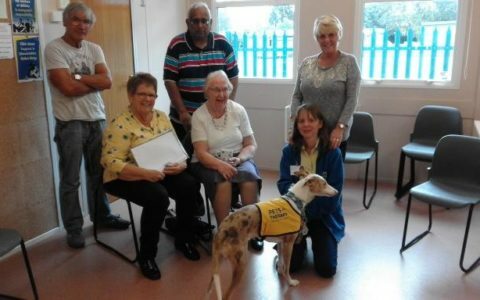 A typical session involves introductions followed by general discussion and allows Carers to express their concerns and identify their own needs. This information is invaluable to the `TEAM` as it will help with the future development of the Café as well as enable instant referral where necessary. If you undertake a caring role, why not click here and register your interests or drop in to reception. We will keep you informed of future developments. The Caring Café is held on the third Tuesday of each month from 1.30pm to 4pm at the Whitestone Community Centre, Magyar Crescent, Nuneaton. Just drop in for a chat and meet the Team led by Chris Gabriel and Dotty Doyle. Also available is a Member of the Carer’s Trust Heart of England Team who is able to offer support to people who care for someone with any type of illness and/or disability. Alternatively, telephone 024 7610 1040. Further information is available through the Surgery. 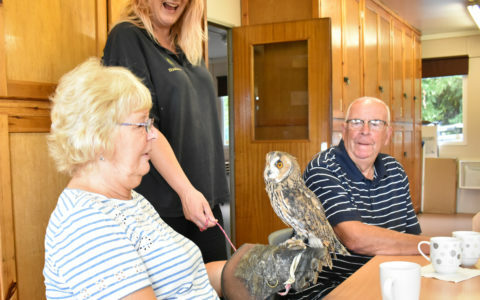 Hawkwise Falconry visits Caring Café.